August is a great time to hit the beach, go play some sports, go for walks and all of that other outdoorsy stuff, but it's also humid and hot and horrible if you're not in the mood. Looking for an excuse to stay inside and watch some Blu-rays this month? We're glad to help you out. Leonardo da Vinci, Alexander Graham Bell, Thomas Edison - all of these men dreamed big, exciting dreams and created technologies that would long outlive them and forever change the world. But none of them thought to put a flux capacitor in a DeLorean. 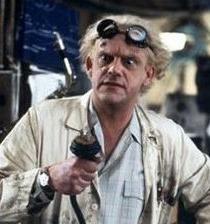 That man would be Dr. Emmett Brown from ' Back to the Future.' Sure, he's a fictional inventor, but that doesn't mean he isn't worth celebrating! The health of your feet is very important. I mean, probably, right? You walk on them, so you may as well treat them well. The alternative isn't a pleasant option, even if it does mean you get to let John Turturro whack on it with a fireplace poker for a while like Adam Sandler did in ' Mr. Deeds.' A dire warning to be sure! Irrational or not, there are plenty of people out there who are scared of clowns - men and women whose only crime is that of trying to entertain. It's tough to find a movie with a clown that isn't a terrifying, sadistic murderer, but ' House of 1,000 Corpses' gives us two out of three in Captain Spaulding. Sure, he's a sadistic murderer, but he's somehow wonderful and loveable at the same time. Celebrate National Clown Week with some tasty fried chicken! Yeah, I'm going to go ahead and take advantage of this platform to wish my sister a happy birthday! She's pretty badass as far as sisters go and her favorite movie in the world is 'De-Lovely' which is, in her words, "a gross musical love story." I'm going to go ahead and blame the auto-correct on her phone for "gross" and just assume she meant "great. " If you're really going to celebrate National Smile Week, you can't do it without the incurably infectious smirk of Tom Cruise. The dude's magical. He smiles, you smile. Of course, the same can be said of his 'Knight and Day' counterpart Cameron Diaz. Combined they put Care Bears to shame. Though he was a childhood hero, it's getting really hard to find any respect for The Hulkster these days. From wrestling far past his prime to starring in a reality show and sympathizing with O.J. Simpson , Hulk just isn't the hero he used to be. His movie roles are about the same though. Dude wasn't really in anything good aside from a bit part in ' Rocky III.' So while toasting the fallen hero, it's right to watch the one good movie he made. By mid-August, folks start to really learn to appreciate just how great their air conditioning is. Keeping cool at home, at work, and in the car is essential during these crazy hot summer months, but it's important not to overdo it, especially if ' Dogma' is at all accurate. As Azrael is quick to state, " No pleasure, no rapture, no exquisite sin greater... than central air." Boy this is a tough one. What movie could possibly have to do at all with archeology while simultaneously being awesome in every way? How about a little movie called ' Jurassic Park ,' which you should be preordering now if you haven't already. Go. The rest of the list can wait until you get back. I mean, you could wait until the 17th to order it if you really wanted to, but it couldn't hurt to jump on it now. "Oh freddled gruntbuggly, thy micturations are to me as plurdled gabbleblotchits on a lurgid bee. Groop I implore thee, my foonting turlingdromes. And hooptiously drangle me with crinkly bindlewurdles. Or I will rend thee in the gobberwarts with my blurglecruncheon, see if I don't!" - Prostetnic Vogon Jeltz, third worst poetry in the universe according to The Hitchhiker's Guide to the Galaxy. Look, it's a long list so I'm just going with 'Moon.' I haven't seen it yet, but it was directed by David Bowie's kid and that's pretty cool. Also it stars Sam Rockwell, and Sam Rockwell is awesome in everything he's in ever. So watch it, and I will too. Let's make it our August goal.